Enrique Gómez-Cabrero Fernández was born in Spain. 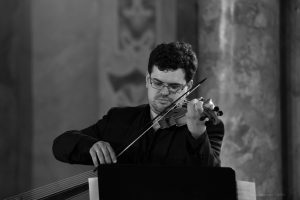 After getting his violin degree with Francisco Comesaña in the Conservatorio Profesional de Música de la Comunidad de Madrid in 2005, his interests about historical performance drives him to take several couses and masterclasses, and in 2006, he started studing baroque violin in the Koninklijk Conservatorium in The Hague with Ryo Terakado. He studied and received masterclasses with some of the best profesionals in the early music stage like Enrico Gatti, Hiro Kurosaki, François Fernandez, Elisabeth Walfisch, Mira Glodeanu, Ton Koopman etc.His musical collaborations includes conductors like Jacques Ogg, Michael Chance, Jaap ter Linden, Patrick Ayrton, Peter Van Heygen, Oscar Gershenshon… He played with groups like the Orquesta Barroca de la Universidad de Salamanca, Orquesta y coro Viamagna, La Ritirata and has been invited as a concertino several times by Contrasto Armónico, with whom he recorded the opera Acis, Galatea e Polifemo, the oratorio La Resurrezione, and Roman Cantatas by Handel (Brilliant Classics & AYROS). He has also been invited as guest teacher in the Damascus Conservatory, and as concertino of the Damascus Baroque Soloists. He had participated in some festivals like Utrecht Oude Muziek Festival, Utrecht Fringe Festival, Nederland Dietrich Buxtehude Festival and Duinoord Muziek Festival. He had performed in some of the best concert halls in Europe, like the Auditorio Nacional in Madrid, Teatro Comunale di Modena and the Concertgebouw in Amsterdam, and had been broadcasted in national radios like the Dutch Radio 4 or the Spanish RTVE.